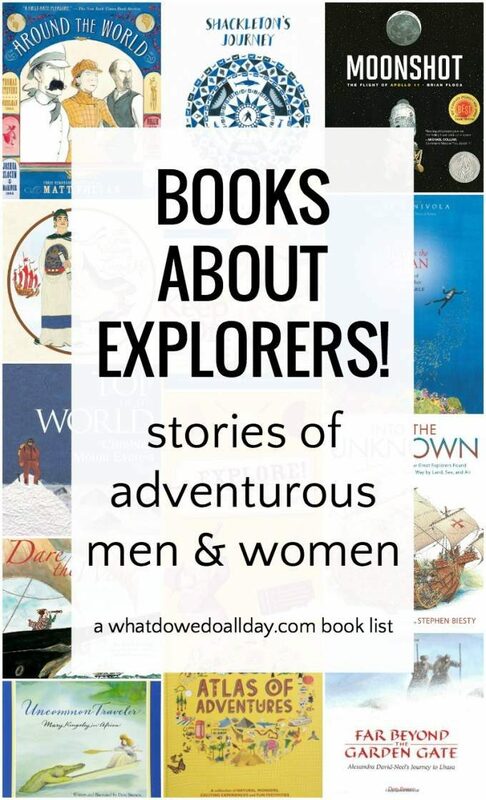 Children love to read books about explorers. I imagine it feeds their vivid imagination as they can so easily see themselves making daring journeys to new places and becoming the heroes of their own stories. That’s a bit of a generalization of course, and yet I do think most humans love a good true adventure story with all of the grit and glamor. I’ve done my best to create a balanced list of books about explorers. I didn’t want it to be a list of biographies of white, European men, but unfortunately, that is the bulk of the books on the library shelves. 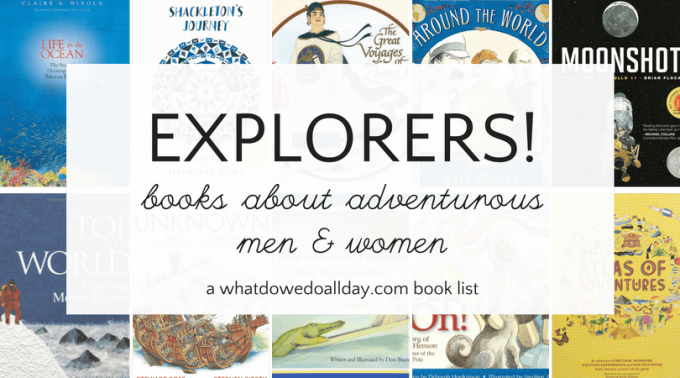 I did find some interesting books about women explorers, though and I think your children will learn a few new travelers to look up to. The Top of the World: Climbing Mount Everest by Steve Jenkins. Jenkins’ marvelous cut paper illustrations take your child on their own journey to the top of Mount Everest. Jenkins covers everything—how to get to Everest, the climbing equipment needed, how to survive the elements, biographical sketches of former climbers, and more. Shackleton’s Journey by William Grill. This oversized book is a glorious tribute to Antarctica adventures. Colored pencil illustrations provide detailed depictions of the perils and triumphs of conquering a harsh but beautiful landscape. I love the attention to detail in both the text and the illustrations and kids will definitely spend a lot of time studying this book as they stuff their head full of information and dream of their own ice-filled adventure. Far Beyond the Garden Gate: Alexandra David-Neel’s Journey to Lhasa by Don Brown. Alexandra David-Neel started out as an opera singer, but after she married she decided to become an adventurer and in 1924 she was the first European woman to visit Tibet’s forbidden city, Llasa. Author Brown includes some of David-Neel’s quotes sprinkled throughout the book and children will be fascinated by this adventurous woman. Life in the Ocean: The Story of Oceanographer Sylvia Earle by Claire A Nivola. Explorers are not just mountain climbers and sea farers! This book starts out with the quiet “investigations” of a girl watching a pond. When her family moves to Florida, she starts her investigations of the Gulf of Mexico. Earle’s love for the ocean and its life drift off the page, and this is a surprisingly moving book with detailed illustrations to explore. It’s a wonderful book to start a conversation with your kids about how explorations of new territory can inspire us to take care of the environment. Moonshot: The Flight of Apollo 11 by Brian Floca. A lovely, large book about the historic 1969 adventure to the moon. Floca’s illustrations bring the wonder and drama of the flight to children, to whom a space adventure seems commonplace. Keep On! The Story of Matthew Henson, Co-Discoverer of the North Pole by Kathleen Krull. You may be surprised to learn that an African-American, Matthew Henson, accompanied Robert Peary on his 1909 expedition to the north pole. Henson loved adventure, even as a boy, and Krull includes a lot of information for kids who love books about explorers. Around the World by Matt Phlan is a splendid graphic novel about three different 19th century explorers, Thomas Stevens who decided to ride his bicycle around the world, Joshua Slocum, who was the first man to sail around the world solo, and of course the intrepid Nellie Bly, a reporter who set out to go around the world in under 80 days. Dare the Wind: The Record-breaking Voyage of Eleanor Prentiss and the Flying Cloud by Tracey Fern. In the 19th century, women did not navigate ships, but Ellen’s father saw his daughter’s love of the sea and nurtured it. She grew up, married a sea captain and accompanied him on his merchant voyages. In 1851 the Flying Cloud, in large part due to the navigational skills of Ellen, sailed around Cape Horn from New York to San Francisco in a record-breaking 89 days, 21 hours. Both the text and the illustrations will make your child feel as though he is there, on the sea, with Ellen and the clipper. Uncommon Traveler: Mary Kingsley in Africa by Don Brown. In the 1890s, English explorer, Mary Kingsley, travelled to West Africa. Until she was 30, the uneducated Mary stayed at home taking care of her invalid mother, while her father travelled the world. She taught herself to read her father’s extensive travel book library and when her parents died, Mary finally got to set out on her own. Atlas of Adventures by Rachel Williams. This is a wonderful, oversized book that your children will want to spend hours looking through. The atlas covers the seven continents and each page features places to go and the exciting adventures, activities and events to experience there. Into the Unknown: How Great Explorers Found Their Way by Land, Sea, and Air by Stewart Ross. Kids will love the fold out illustrations and the detailed drawings in this book. It is absolutely chock full of information. Ross includes fourteen different explorations and looks at the persons, equipment, and geography involved, answering every kid’s persistent desire to know how the explorers accomplished such dangerous feats! Explore! The Most Dangerous Journeys of All Time by Deborah Kespert. The book starts out with a timeline and then the author divides the adventures and explorers by terrain. The sections are polar, ocean, land, desert, sky and new frontiers. Each section features several different explorers and expeditions, accompanied by photographs, notes, glossaries, maps and more. The book does feature a few women, but the majority of the explorers are men of European descent. When it comes to explorers who are colonialists, I think it also important for parents to seek out books that give a fuller picture of the impact explorers had on “new territory.” Glorifying colonialism is a real problem.